As a candidate when looking for a job, have you found yourself confused when the job profile mentioned on a job portal is not clear? Sometimes the person from HR team tends to put out confusing info about the job description and job specification, leading to an unclear picture. Job hunting is a task in itself, if there is incorrect information on which the candidate has applied, it is the waste of time and energy for the candidate as well as the HR team. Understanding the clear difference between job description and job specification is utmost important for a candidate who is going for an interview. 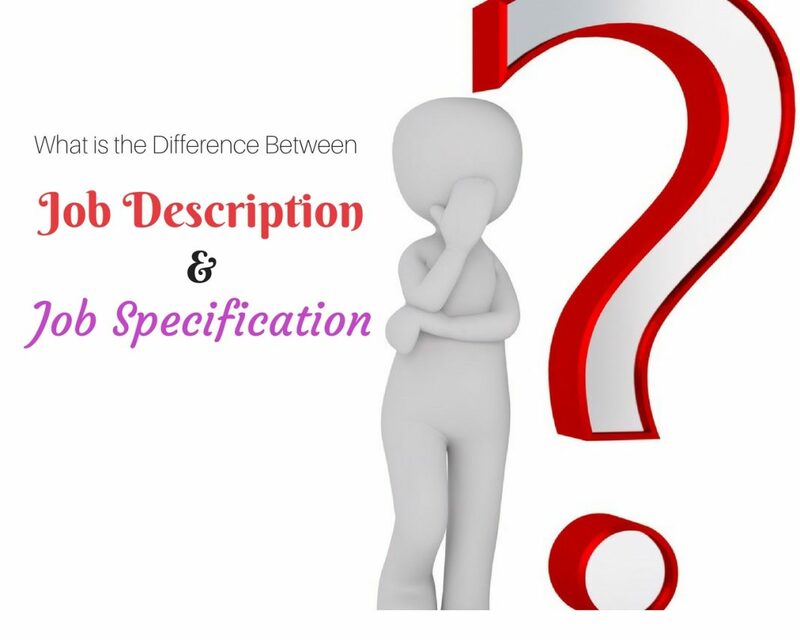 Job description and job specification are easily confused terms with completely different meanings. The job description explains and provides the general overview of the job. In other words, it talks about the nature of the job and the expectation required from the candidate, on a day to day basis. It is a simple overview of the work as per the department, and how the candidate will be able to fit in it, to complete the picture. After analyzing the job role with the clear understanding of its requirements only, a job description is formulated. The job description is derived from the fact that in the first place, analysis of the job role is seen, including the deliverables that will be needed to fulfill that job. Job specification is precise information and requirement for a job role. It is derived from the further analysis of a job description. It mentions about the eligibility criteria of the job role, for example, qualifications, age limit, previous experiences, etc. For example, the relevant degree or diploma may be needed to fulfill that certain role. A certain software or a technical knowledge that may be needed for that job role. Job specification gives a deeper analysis required by the company related to the job role, while a candidate can also review their own eligibility criteria to be able to fit into the desired role. It explains about what to do for the job. Explains about the eligibility for the job. If you want to write an effective job description here is a good example to look. Location of the job: The relevant city where the job role is located. A brief description of the job: Will explain the requirements to be fulfilled by the candidate. Few of the benefits of writing the job description clearly on the job portal are discussed below. It gives a clear understanding of the type of a candidate a company may require to fill a certain position. Candidates get a clearer picture of the company’s requirements. Gives an insight of the workplace and other factors related to the job role. Once you have analyzed the job description, then it is time to go into the specification for that job role. Qualification: A graduate or masters degree in marketing. Few points related to the skills and knowledge are also shared here, software or technical skills. Develops are the deeper understanding of the job role and its requirements, and how it will lead to the growth of an organization. The defined skills create a common platform for a company and a candidate to meet at an agreed point. Explains the technical knowledge needed and required. Whether you are the employer writing the job description or specification or the candidate looking for a job. A clear communication makes the work easy for both. Even for the candidate, before going for a job interview understand the difference well as it will save them from an embarrassing situation.